3D Charts for Excel converts an Excel table to a 3-D chart object. 3D Charts for Excel provides an easy and powerful way to analyze a variety of tabular data from Microsoft Excel in a 3 dimensional graph view. 3D Charts for Excel enables the viewing and examination of Excel data as a three dimensional object in three dimensional space. The 3D object can then be manipulated via animated rotation to the desired view to highlight trends and observations directly on the program screen. The 3D chart can then be saved and exported to a file for use in presentation and reporting applications and publications. 3D Charts for Excel works with tabular data of at least three columns. Three of the columns are selected with each row in the table representing a point in a three dimensional space (x, y, z). The selected data is transformed into a table valued function z = f (x, y). 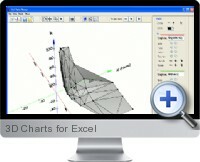 3D Charts for Excel then visualizes this object. The object can be viewed from different angles to determine the exact value of its points, to take snapshots and to customize different display settings.